Last month, I had the pleasure of giving my first live reading at The Ripped Bodice book shop right here in Los Angeles. The event was Lady Jane's Salon OC, hosted by author Beth Yarnall. 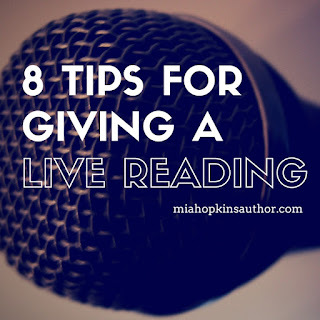 You can read more about my experience in this post, but today I'd like to share a few things I learned before and during my live reading. As eclectic as authors are in their careers and interests, I assume many of you already have public speaking or stage experience. However, this list is directed toward folks who are uncomfortable or out of practice when it comes to speaking in front of an audience. If you'd like to share your own tips or if you'd like to chat further, please comment below or message me! 1. Plan your presentation, focusing on your use of time. Ask the host of the event how much time you have and sketch out your reading based on this. Factor in a couple of minutes to introduce yourself, to introduce the work, and to answer a few questions following the reading if that's part of the program. Wear a watch or keep an eye on the clock in the room. Respecting the time of your host, your audience, and the other readers at the event will mark you as a professional. 2. Choose the right passage to read. In general, select a visually-intriguing or action-oriented passage wherein SOMETHING HAPPENS. Avoid too much internal dialogue. Avoid external dialogue with more than two characters unless you're Mel Blanc. End with a hook. In selecting your passage, consider your audience. Are you the star of the show or part of an ensemble of readers? Will everyone there be familiar with your books and your genre? If not, consider the passage you read an introduction to you and your work. Whatever genre you write, choose an excerpt that will intrigue the audience and showcase what kind of a storyteller you are. 3. Practice, practice, practice...then practice some more. Read your passage aloud to an empty room, to your dog, to your spouse, to your coworkers, to your plumber, to anyone who has the time to listen. Record yourself and play it back, listening for garbled words or rushed sections. Don't do much public speaking? Not a problem as long as you practice. To prepare for your live reading, you will have to condition your voice. Think of your passage as a piece of music and your voice as the musical instrument you're going to use to play it. Obviously, you're not singing, but you'll be using the same muscles. Stand up straight and pretend there are stacks of heavy books on each of your shoulders. Take a few deep breaths through your nose. You should feel cool air at the back of your throat along your soft palate, the soft tissue just past the hard roof of your mouth. Not to get too nerdy (oh, who am I kidding) our language is made up of many velar consonants, sounds created right there on the soft palate, e.g. hard g (go), hard c (cat), and -ng (ring). As you practice your reading aloud, concentrate on speaking from this area and you will sound less nasal. It will also be easier for you to project your voice absent a microphone, which I didn't have at my reading. If there are awkward words in your passage, change them or cut them. Use pauses, vary the volume of your voice, and emphasize certain words to keep from lulling your audience to sleep. Just like a piece of music, your passage will benefit from a dynamic performer. You don't have to ham it up, but definitely give your words the vitality they deserve. 4. Put on your game face. Arrive at the venue early. Give yourself time to get comfortable in the space. Have a drink of water, visit the facilities, check your clothing and appearance, and get a feel for the crowd if possible. If there are fewer people or more people than you anticipated, don't worry. Your job is to give each person in that room a good reading. Don't let the head count distract you. When you're up, don't start too quickly. Take a few seconds to breathe, make eye contact with the audience, open your water bottle, whatever. This is your stage for the next few minutes. Inhabit it and make it yours. Again, do not rush. If you followed my directions and practiced, this is the easy part. 7. Take questions if necessary. I've always admired public figures who could field questions in a respectful, engaging way. Sometimes audience questions are nutty, intrusive, or inappropriate. Sometimes an audience member grabs the mike to monologue for whatever reason. Whenever possible, do not make anyone look stupid even when they are, in fact, stupid. If you don't want to answer a particular question, address the topic in a tangential way and talk about whatever you want. To manage time, if one audience member's questions stretch on too long, invite them to speak with you or contact you after the reading. 8. Thank the host and the audience. Leave the stage (again, don't rush!). Make sure to listen to the other presenters if you can. Then go get a drink. You've earned it. To read more about my first live reading, take a look at this post. For self-editing tips that authors can use right now, please click here. For more information about my books, click here.